Axel Heiberg Island, Nunavut, is Canada’s second northernmost island, located in the High Arctic approximately 1,200 km from the North Pole. Baffin Island, Nunavut, 507,451 km2, 1,500 km long and 200–700 km wide, is the largest island in Canada and the fifth-largest island in the world. Balaklava Island, 8 km2, situated off the N coast of Vancouver Island, is located between Nigel and Hurst islands, and is flanked by Queen Charlotte Str in the N and Goletas Channel in the S. It is 15 km NW of Port Hardy, BC. This tiny island has a lighthouse at Scarlett Pt (1905) to aid shipping. Bathurst Island, 16 042 km2 and over 18 000 km2 including its offshore islands, is located in the Arctic Archipelago. The present position of the North magnetic pole is near its northern end. Beechey Island is on the north side of Lancaster Sound off the southwest corner of Devon Island at the entrance to Wellington Channel in the Arctic Archipelago. Belcher Islands are located in southeastern Hudson Bay, 100 km west of Grande Rivière de la Baleine, Québec. The total land mass of about 13 000 km2 is composed of a group of long, narrow islands, lying northeast/southwest along a very extensive coastline. 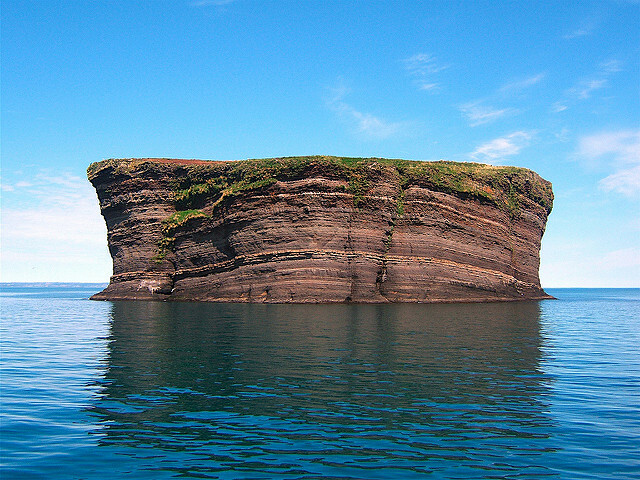 Bell Island, 34 km2, the largest island in Conception Bay, off Newfoundland's Avalon Peninsula, is a flat outcropping of Ordovician sandstone and shale interbedded with red hematite, an iron ore.
Borden Island, 2794 km2, is one of the Queen Elizabeth group of islands in the High Arctic. 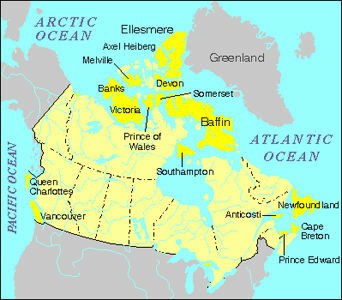 Most of the island is part of the Northwest Territories; the easternmost part of the island is part of Nunavut. Brunette Island, 20 km2, is situated at the mouth of Fortune B on Newfoundland's S coast, 18 km S of Connaigre Head. 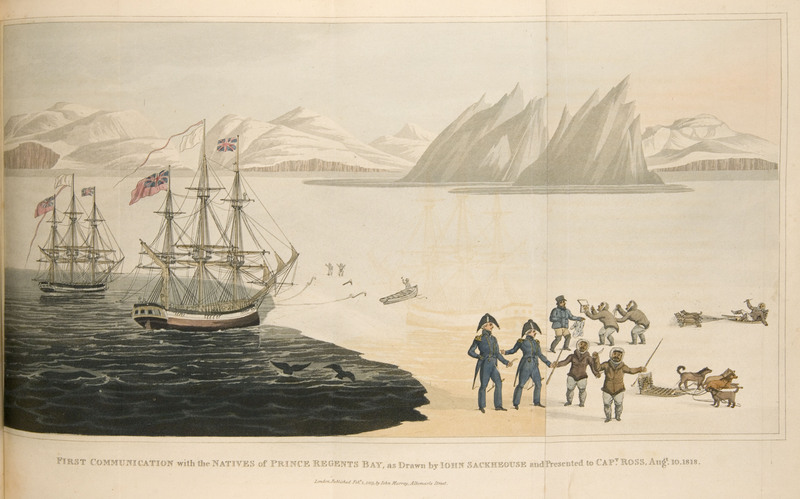 The island, roughly triangular, measures 11 km E-W and 6 km N-S. A steep ridge backs the NW shore, at one point rising to 160 m.
Bylot Island, 11 067 km2, is nestled into the northeastern corner of Baffin Island at the entrance to Lancaster Sound. Cape Sable Island is a flat, wooded island off the southwestern tip of Nova Scotia. Connected to the mainland by a causeway on the north side, it shelters the waters of Barrington Bay to the east. 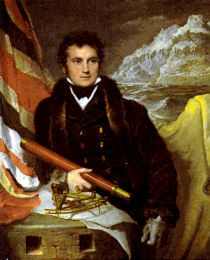 The MIKMAQ hunted seals off Cape Sable Island. Cormorant Island is a small, wooded island fringed with rock beaches close to the northeast coast of Vancouver Island. ALERT BAY, a fishing port and commercial centre for nearby logging communities, is located on its south shore. 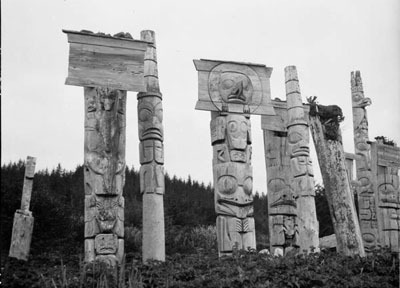 The island boasts some of the finest TOTEM POLES on the BC coast. Cornwall Island, 2258 km2, located in the northern ARCTIC ARCHIPELAGO, some 100 km W of Ellesmere I. It is generally low, rising to a 375 m summit towards the W. The island was discovered in 1852 by Sir Edward BELCHER and named North Cornwall. Cornwallis Island, Nunavut, 6995 km2, is located between Bathurst Island and Devon Island in the Arctic Archipelago. It is separated from Somerset Island to the south by Barrow Strait. 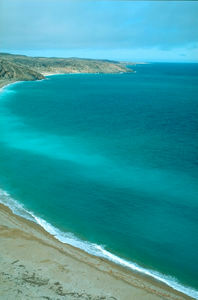 The island is generally flat, though there are prominent (400 m) cliffs along the east coast. Deer Island abuts the border with the US at the entrance to Passamaquoddy Bay on the south coast of New Brunswick. 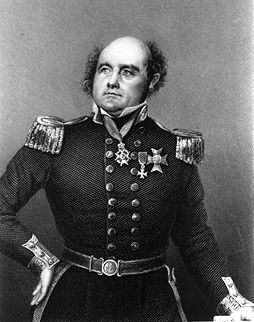 Long in dispute with the US, sovereignty over the island passed to NB in 1817. The name is probably descriptive. Fishing is the most important economic activity.